The Scottish indie rockers Frightened Rabbit make dramatic, stadium-sized anthems. They’re a gritty emo band that leans into folk here and punk there, but lead vocalist Scott Hutchison is consistently self-deprecating and downright sad. They have a knack for reeling you into the type of morose song you wish wasn’t stuck in your head. The legendary Blues troubadour Robert Cray has been leading bands for over 40 years. He’s opened and worked as a session player for the likes of Eric Clapton and Buddy Guy, and has the rare achievement of a singular sound as a guitarist. But his acclaim as a guitarist has distracted from Cray’s singing voice, a booming soul powerhouse worthy of its own praise. The Boston band Dispatch has a rare appeal. Their acoustic approach is still inspiring kids around the country to pick up guitars and pluck out notes, but they’ve never really had a crossover hit. They’re not quite a jam band, but their music and general appeal has always translated best to the stage nonetheless. After a long-ago breakup and reunion, the group is back again with new music and a sprawling nationwide tour. 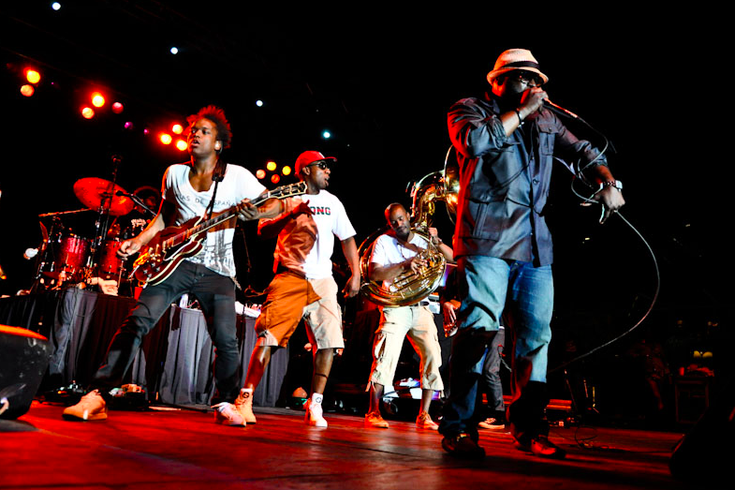 Philly’s homegrown festival circuit grows a little bigger each year, and The Roots have managed to crank up the prestige of their annual Roots Picnic accordingly. This weekend, the legendary Roots Crew throws their big party with an expert eye for curation, crowding the top of the bill with icons like Pharrell and Solange but making room for local up-and-comers like Tunji Ige and PNB Rock earlier in the day. Together with a prolific Seattle hip-hop producer, the soul crooner Mayer Hawthorne has reinvented himself with a different decade’s music. Instead of the sweet ‘60s soul that Hawthorne mined as a solo artist, his joint project with Jake One, Tuxedo, looks to the retro funk of the ‘80s. Their music is upbeat and groovy and sounds like classic pop despite the obvious homage. Now in their fifth decade, the English heavy metal legends Iron Maiden are somehow still soldiering on. Since the mid-’70s the band have cemented themselves as not just musical pioneers, but as a household brand name synonymous with metal itself. It’s no surprise then that even this many years later, an Iron Maiden tour is a spectacle, and there can’t be too many of these left after all. For almost 20 years, Brother Ali has been a bonafide rapping preacher, building up his own platform as a sage indie artist. His music is deeply autobiographical and persistently political, but Ali’s overarching theme has always been love, often filtered through the prism of his religion and touching everything in sight. His newest album, “All the Beauty in This Whole Life,” is a hopeful masterwork, accessible and challenging at once.